Explore the processes behind climate change today and in our recent past. Throughout history, the Earth has experienced many climate changes. So how can we explain these changes and how can we tell the difference between natural and man-made climate change? To understand this, we need to first understand the complex interplay between all of the processes that drive the climate. Some mechanisms are related to external processes, such as changes to the Earth’s position in relation to the Sun and variations in the strength of the Sun, while other processes are related to variations in ocean currents and wind patterns in the atmosphere. This article gives an overview of some of the most important mechanisms. We start with the processes that drive climate changes that we can see and feel today, and have shaped the climate throughout the period of time in which human civilisations have developed. Read more about the processes that drive the climate on longer, geological, time-scales in part two, to follow soon. Scientists have known about greenhouse gases for more than a century, ever since the world renown Swedish scientist and Nobel Prize winner Svante Arrhenius, first described how carbon dioxide (CO2) can trap heat in the atmosphere. It is their heat-trapping ability that keeps the planet habitable, and it became known as the greenhouse effect. In the greenhouse effect, gases in the Earth’s atmosphere trap some of the heat from the sun that reaches the Earth’s surface. Without these gases the Earth would quickly become a frozen planet, as the atmosphere could not hold onto this energy, which would be reflected and emitted back into space. The atmosphere’s current composition of greenhouse gases ensures a comfortable average temperature of 15 degrees Centigrade. Without them, our Earth would be a chilly minus 18 degrees. But the greenhouse effect is a finely balanced system, where a drop in greenhouse gases can plunge the planet into an ice age, and an increase causes global temperatures to rise significantly. Both volcanic activity and changes in plant growth across the planet can alter the level of CO2 in the atmosphere. But these natural processes typically change CO2 and temperature much more gradually than the changes that are currently occurring as a direct result of our activities on Earth. Cattle farming, rice cultivation, and deforestation, have all gradually contributed to increasing the amount of greenhouse gases in the atmosphere over the last few centuries. But it is since the industrial revolution, and the burning of fossil fuels, that the concentration of greenhouse gases in the atmosphere have increased significantly. In 1895, Arrhenius had already predicted that man-made emissions of greenhouse gases would cause the global temperature to increase. But today, we also know that this rise in temperature also influences atmospheric pressure systems and wind systems (storms) around the planet. By comparing current trends in climate change with all the mechanisms than can cause the climate to change, we can decipher how much of the changes happening today are down to natural variations or the increase in greenhouse gases by our many activities. Recently scientists have shown that man-made climate change had already begun around 1830 CE, almost 65 years before Arrhenius had first predicted it. Climate change since the industrial revolution is not as extensive as the changes experienced from one ice age to the next. But the speed of the changes that are currently under way are problematic for the animals, people, and plants that need to adapt to a changing environment and the conditions that support life on planet Earth. Moreover, there are more people living on the planet today than at any other time in our history—more than seven billion people. That is more than 2,000 times more people than are estimated to have been living on Earth at the end of the last ice age, 11,000 years ago. All of us will need to adapt in some way to new climatic conditions, while billions of us live in areas that will be hit especially hard by increasingly extreme weather. For example, severe effects from hurricanes, storm surges, and drought will all become more commonplace as a result of climate change. There are a number of other natural mechanisms that drive the climate system today. The interaction between ocean circulation and the wind systems that encircle our planet create complex patterns, which we sometimes cannot fully explain. El Niño is among the most famous and dramatic phenomena. Normally the constant trade-winds blow over the sea in the Pacific Ocean near the equator over the coast of Australia, where it warms. Some years, this water will suddenly begin to flow back across the Pacific towards the coast of South America. This change in winds affects where rains fall around the Pacific Ocean and South East Asia, and also cause global temperatures to temporarily increase. For example, El Niño was partly to blame for the exceptionally high temperatures in 1998 and 2015 and 2016. The North Atlantic Oscillation (NAO) has an even bigger effect on climate in Europe and the east coast of North America. The NAO phenomenon is related to the variations in the strength and location of a semi-permanent centre of low pressure over Iceland and a high pressure over the Azores. These atmospheric pressure systems vary in strength and their precise geographical location from year to year. This affects the strength and direction of wind systems, and therefore is essential for weather in Europe and North America. Depending on the nature of the pressure systems, they can transport warm and humid air or cold and dry air to various parts of Europe and the USA. This can have big impacts on our weather. For example, the winter of 2009 to 2010 was particularly cold and snowy, while Greenland was unseasonably warm. This pattern is known as a negative NAO. The following winter was exceptionally warm in Europe, and was an example of a so-called positive phase of the NAO. The Atlantic Multidecadal Oscillation (AMO) is another important mechanism. It relates to the cyclical changes in water temperature of the Atlantic Ocean. These changes occur primarily due to changing strength of ocean circulation in the Atlantic that oscillates every 55 to 70 years. Variations in temperature are only small, around 0.5 degrees Centigrade from the coldest to the warmest temperatures. But the phenomenon has enormous significance for climate, especially in the tropics and sub-tropics, because the power of hurricanes increases dramatically when ocean temperatures in the Atlantic increase even slightly, while colder ocean temperatures can cause extreme drought in the Sahel, south of the Sahara. AMO is a part of the reason why temperature in the 1930s to 1950s were so high, and it was also an important reason why extreme famine struck the Sahel in the 1970s. When we talk about the climate change that is happening today, we are often referring to the changes that have occurred over the past 100 to 150 years. In this short time, temperatures have risen significantly. But when we compare this with conditions throughout the last 11,700 years in what is known as the present day inter-glacial period, we can see that climate has changed many times. In the final stages of the last ice age, the large ice sheets that had covered northern Europe, retreated. The ice age ended 11,700 years ago, at which point the climate was considered to be very unstable. But by 8,000 years ago the interglacial warm period was well and truly under way and our climate was a couple of degrees warmer than it is today. This warm period lasted until about 5,000 years ago. This happened because the incoming radiation from the sun in the northern hemisphere summer was higher than it is today, as the Earth’s axis was tilted closer towards the sun, allowing more sunlight to reach the high latitudes in summer. But it is not only the change in the Earth’s orbit around the sun and the tilt of the Earth’s axis that plays a role in the amount of sunlight that reaches the Earth. The strength of the sun also changes over time. The amount of energy that the sun emits changes in 11-year cycles and over the course of decades to centuries. This has contributed to climate change in recent millennia. Even though variations in the sun’s energy play a role in climate, it is worth noting that variations in the sun’s energy output are very small and often do not relate to known climate changes in the past. The sun’s energy was higher in the 1930s to 1950s and can together with the AMO partly explain the particularly higher temperatures back then. But today the sun’s energy output is not especially high, and cannot account for the current trend of increasing global temperatures. Throughout the last 5,000 years, summer temperatures have gradually fallen, especially so in the last 3,000 years. Some of this cooling was due to declining energy output from the sun. But new research recently demonstrated that this cooling was in fact largely a result of ash from numerous volcanic eruptions, combined with deforestation of forests around the world over the past 2,000 years. Even though long-lasting volcanic activity can help to warm the planet as they emit greenhouse gases, relatively short periods of explosive volcanism (decades to centuries), where vast amounts of dust spew into the atmosphere, can in fact cool the climate. Today we are able to study all of these earlier periods of climate change and decipher which of these mechanisms were to blame. It has given us a long history of climate change and the necessary knowledge and context to understand the processes that are changing our climate now and may do so in the future. This is how we can tell the difference between natural cycles and man-made climate change. It is this breadth of knowledge that explains how human activities through the vast amount of CO2 emitted into the atmosphere since the 18th century are causing global temperatures to rise today. In the next article we will travel even further back into our geological history and discuss the dramatic processes that have changed our climate on even longer time-scales. These are the processes that have shaped the landscape all around us. The NAO occurs due to variations in the strength and position of a semi-permanent low pressure over Iceland and a high pressure over the Azores. This creates a strong westerly wind that brings warm and humid air up to northern Europe, and pushes the warm water from the Gulf Stream closer to the European coast. This is called a positive NAO. In some years, both of these pressure centres become weaker and shift south. This is called a negative NAO. It means that the west wind becomes weaker and shifts to the south. This weak wind does not pull quite so hard on the Gulf Stream and more of the warm water will instead flow back towards the west, where it moves up along the coast of West Greenland. In a negative NAO, North Europe becomes colder and drier (especially in the winter), while West Greenland and the east coast of Canada becomes warmer. The last 2,000 years has been punctured by many notable swings in climate, which have lasted for hundreds of years at a time. 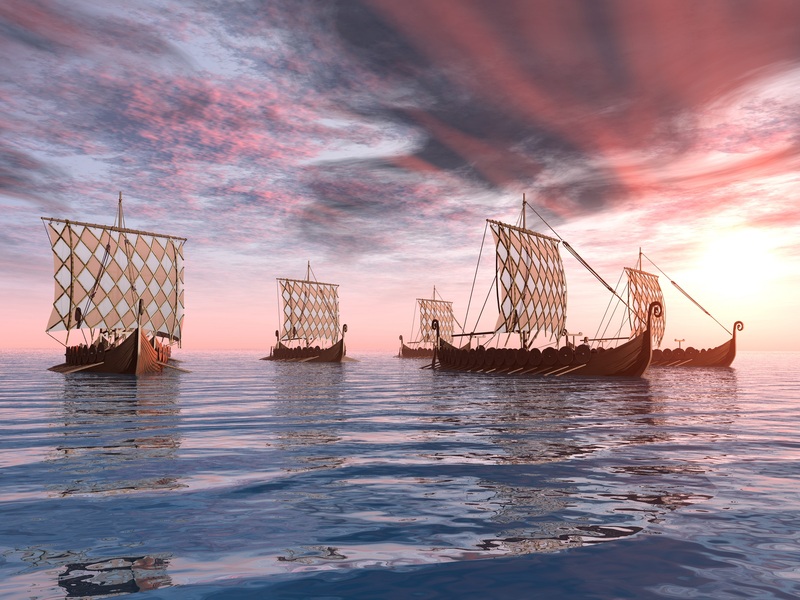 The Viking Age is one such example of a warm period, which made it possible for Norsemen to populate Greenland. The name is rather confusing as this was not an ice age at all, but it was a period in which cold, crop failure, and famine occurred throughout much of Europe, especially between 1650 to 1700 CE. These short-term swings in climate likely occurred due to a number of the mechanisms described in this article. Namely, changes in the strength of the sun and the NAO. Many studies show that during the cold Little Ice Age, the sun emitted less energy than it did during the Medieval Warm period or today. At the same time, the NAO is known to have been stuck in a negative phase during the Little Ice Age, whereas during the Medieval Warm Period it was stuck in a positive phase. This meant that the climate in Europe was especially cold during the Little Ice Age, while the seas around West Greenland were particularly warm.